Do you have a dream to start something new? It might be a big idea like a new ministry or a new non-profit, or something more personal like going back to school or changing your field of work. As I begin a new writing project, I always think of it as Starting Something New. 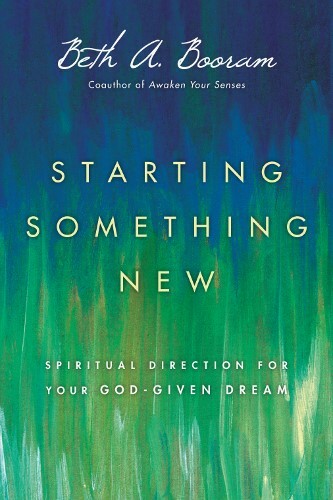 That’s why I was drawn to Beth Booram’s book, Starting Something New: Spiritual Direction for Your God-Given Dream (IVP Books, 2015). I’ve gained a lot of great start-up advice from books and online sources about setting goals, getting things done, staying motivated, and making your dream a reality. The Type A, multi-tasking side of my personality loves that kind of energy and activity. But the more reflective Type B side of my personality has been savouring Beth Booram’s book for the last several months. Instead of being so task-driven, her book encourages readers to reflect on how God is drawing us. Instead of forging ahead come what may, her book encourages listening and learning, exploring and experimenting. This is spiritual direction for your God-given dream as her subtitle expresses it. I love the way Beth traces her own story through the book, and also introduces readers to Katie Taylor who had a dream that became Film School Africa, Phileena and Chris Heuertz who started Gravity as a centre for contemplative activism, Chris Smith and the Englewood Review of Books, and many more people who started something new. In addition to these stories of other dreamers, she includes questions for reflection and practical tips to try. Here are a few of my favourite quotes, followed by a video with Beth Booram on bringing your God-given dream to life. Your turn: What have you learned from growing your God-given dream? What examples, advice, or resources do you have to share? Disclosure: I received a complimentary copy of this book from the publisher. I was not required to write a positive review, and as always, the opinions I have expressed are my own. Thanks, Shirley – the quote from Mother Teresa fits well with something else Beth says in her book: “the birth of small, creative, outlandish endeavors remind us that God still takes the risk of birth.” Readers may also be interested in the Dream Incubator workshop next month at Sustainable Faith Indianapolis http://www.bethbooram.org/register-for-ssn-retreat.html.